If these whales could speak, what would they say to us? Such a question may seem uncomfortably weighty for the context its found in, and may get quickly brushed off. But there are deep implications at stake, and its time for those of us who have visited Shamu in the past to reevaluate a few things. It has been said that groups who advocate for the humane treatment of animals are speaking for those without a voice. (My husband says I blog for whales because whales don't have laptops.) 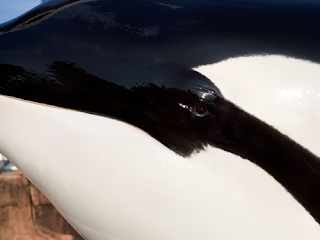 It's true that Orcas can't open up their mouths and say, "Hey, I'm unhappy here. I'd much prefer the endless seas to this small concrete tank," or, for that matter, "I'm a perfectly content creature, all my needs are met." Maybe, if they could, this would be a less complicated issue. But I am of the opinion that these animals have done everything in their power to communicate to us their opinion of captivity. They have demonstrated, in a manner many would consider obvious, that a captive environment is harmful for them both emotionally and physically. They just haven't been listened to. By accounts of eyewitnesses and autopsy reports, both of these attacks were brutal and deliberate. Nothing was done in response to the first to prevent the second. These events are obviously horrific tragedies. They demand that certain ethical questions be answered. Firstly ask how safe humans can possible be working with captive whales, secondly, to ask what these actions say about the well being of the whales themselves. Considering the vast intelligence of Orca whales and the fact that no human has ever been killed by one in nature, we may gather that by these killings the whales are telling us, "I am wild. I am pent up. I am frustrated. I am not meant to be tamed." 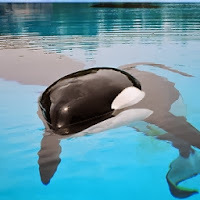 In 1980, a Killer Whale named Hugo died of a brain aneurysm after repeatedly bashing his head against the walls of his incredibly small tank at the Miami Seaquarium. This was not an isolated event. Hugo once rammed his head so hard into the wall that he required multiple stitches He was aware of his self-harm, yet persisted in it. Who can trace the root of such unnatural and unsettling behavior? Maybe it was despair, a determined attempt to escape, or a sort of psychosis. In any case, this animal was clearly stripped of it's joy. "I am trapped. I am desperate. I am I am miserable. I want out." You don't need to look far to find stories of mother's wailing for their babies, mourning for weeks after park management has separated them. You may recall the story of Namu, who on lonely nights called to his family in the Ocean from his Sea Pen, as they answering back with forlorn calls of concern. I know my family. I feel their absence, and it pains me. I long to be with them. 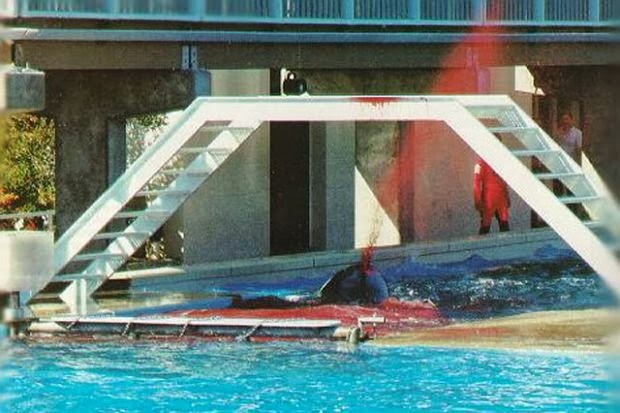 Whales float lifelessly in SeaWorld pools, their dorsal fins toppled over. I am meant to swim far and straight for hundreds of miles a day. Even my anatomy could tell you so. 1989: Kandu attempts to show dominance over Orky by ramming her, but she misses and hits a concrete wall. 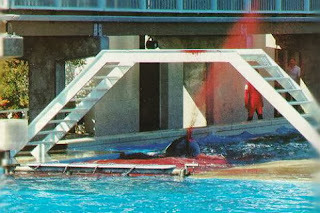 Thousands of tourists watch as Kandu bleeds to death. (No wild Killer Whales have ever been recorded fighting to the death.) I do not have the space or freedom to express aggression as I would in nature. I have no where to run from an attack, no where to hide. This artificial enclosure is a determent to my health. Though these statements may not have been in spoken words, we can be certain that killer whales are trying to communicate something to us. The problem is not that they have no voice, its that their voice is invalid. Like with so many of our interactions with animals, consideration of the whale's well being is second to our personal gain on their behalf. The industry will continue to perpetuate the idea that their whales are happy and healthy because their multi-million dollar business rests on it. Young people who get enchanted with the idea of swimming/working with whales will buy into what the theme park tells them. They are large in number, and they cling to the mantras of inspiration and education put out by Sea World, because it sustains for them a future dream and present interest. 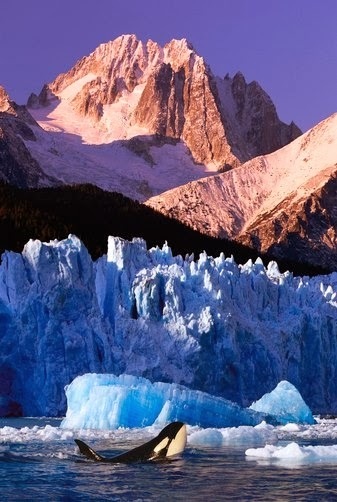 In both cases, however well intended, the needs to the animal come second to the desires of the person. But I'd venture to say most of the people who visit Sea World don't think about the animals as unhappy, they're just normal people who don't know any different. That was where I landed, at least. Most visitors are loving moms and dads who want to see their kid have a good time at an animal theme park. 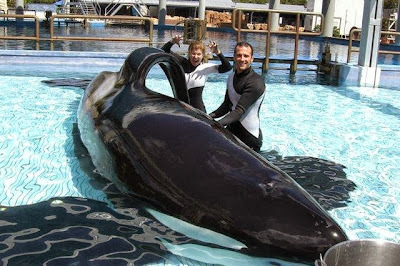 Until recently, there hasn't been a lot of media about the dark side of Shamu. But now with four human deaths, and an overwhelming number of ex-trainers coming forward, our cartoonish mental image needs a serious makeover. "everything we have learned about these animals tells us that they are absolutely unsuited for captivity, that it is emotionally, physically and socially devastating for them." In order to support captivity, you have to say that all of those experts are wrong, and the entertainment industry is right. All credible signs point to the fact that Shamu and his pals are deeply unhappy. Surely it is not our within our rights to deprive them of that God-given happiness, to reduce their lives to a few short, strained, confused and miserable years, as if their small portion of personal joy were inconsequential, disposable, worth sacrificing for a dollar amount. I'll leave you with this beautiful prayer by St Basil from the 300s AD, and a plea to reconsider for the sake of the captive whale. May we realize that they live not for us alone, but for themselves and for Thee and that they love the sweetness of life even as we, and serve Thee better in their place than we in ours.